Measuring and subsequent grading/sorting of roller bodies is a essential component in the manufacturing process of the bearing industry. CENSOR measuring and sorting machines do fulfill the requirements concerning quality, speed an precision. Great efforts have been made in the bearing industry for many years to control the grinding process in such a way as to reduce or even to eliminate the measuring and grading process of roller bodies altogether. Nevertheless in very many cases in terms of quality control and assurance there is no alternative to using measuring and sorting machines. Also requirements of measuring capabilities are rising steadily. 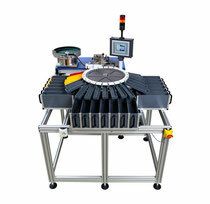 Using CENSOR sorting machines we can offer you precision down to the sub micron. Depending on the respective product range /diameter range / length range we are in a position to propose and offer suitable sorting machines to fulfill the requirements of our customers. Our product line CENSOR is used successfully for decades in the bearing industry. Practical orientation and permanent innovations are guarantors for the fact that the CENSOR sorting machines do meet the highest requirements of our customers. Our experience enables to compile suitable special solutions to your special requests.